This is our reference NY-15337. 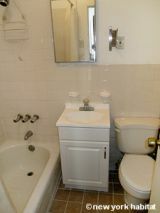 Enjoy your stay in this modern one bedroom apartment on Lenox Avenue in Harlem. Found on the 5th and top floor (4th for Europeans) of a lovely walk-up brownstone building dating from the early 1900s, renovated but still retaining original charm, as seen by the entrance ceiling mouldings and chandelier. There is a buzzer/intercom system to allow in guests. 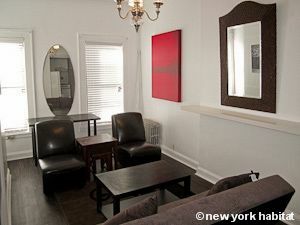 The apartment has a boldly modern flair, furnished with darkly stained wood pieces and maroon/plum accents. 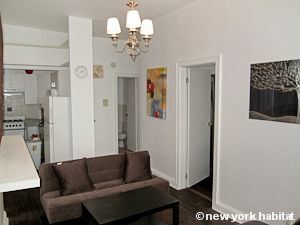 It has an air-conditioned living room with a sofa which you can unfold to a twin bed, with high ceilings and an open kitchen in the rear corner. The two large windows in this living area are facing the Northwest, allowing in plenty of natural light and offering clear views over trees and the Harlem area from a 5th floor vantage point. 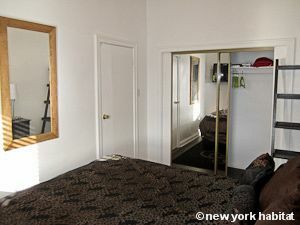 The bedroom, which is to the left of the living room, is furnished with a queen size bed facing a wall-mounted flat screen television and sliding door closets to provide storage. 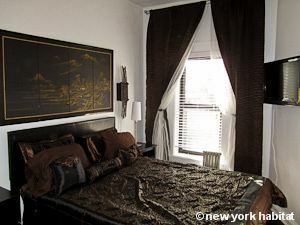 This one bedroom apartment has perfect location if you are looking for a central spot in Uptown Manhattan, New York. Many nearby restaurants are hallmarks of the neighborhood, such as: Sylvia’s for its famous soul food and Red Rooster, both less than four blocks south on Lenox Avenue. The Lenox Social (across from Sylvia’s) just opened its doors and offers quality beer and food options. You also have the well-known Apollo Theater, a landmark, is within walking distance (2 blocks). For a little fresh air, check out Marcus Garvey park, only a block away, or you can even visit Central Park, only 2 short subway stops from your apartment (or a nice stroll)! 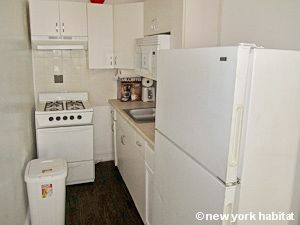 Also 2 blocks away on 125th Street you have a shopping corridor with the convenience of many grocery shops, pharmacies and even a Starbucks and H&M. The closest subway station is also on 125th street which gives you access to the 2/3 line that take you to through the Upper West Side to Times Square (5 stops), Downtown Manhattan (7 stops), or to other NYC boroughs of the Bronx and Brooklyn. Electric/Gas, Cable & Internet, A/C included.